If you’ve been frequenting the DopeHouse (or the internets in general), you’ve surely seen at least one of Marvel’s awesome variants to classic Hip-Hop album covers. From Illmatic to Aquemini, Straight Outta Compton to Get Rich Or Die Tryin, the talented crew of illustrators have been putting their foot in these designs for a few months now. And as they begin to come up on the original goal of 50-60 covers, we picked the brain of Marvel’s Editor-In-Chief Axel Alonso about the inspiration behind the project, the warm response from artists, and the wide range of ethnic backgrounds that help make up the team. What inspired this concept of recreating classic hip-hop album covers with Marvel characters? We do a lot of theme-based variants – homages to movie posters, fine art, album covers – so I’d been toying with the idea of doing a wave of variants inspired by Hip-Hop album covers. The phenomenal response to the Run the Jewels variants we did a few months ago confirmed something I knew in my gut: a lot of Marvel Comics fans are Hip-Hop fans, and a lot of Hip-Hop fans are Marvel Comics fans. Do you recall the first conversation that came up regarding remaking these album variants? So there no push back before the idea actually came to fruition? No pushback whatsoever. We do theme-based variants all the time – covers that homage movie posters, fine art, American history, album covers. What set this initiative apart was its scope – we’re doing one for every new release – and the theme itself, which has hit a nerve. I have to assume that there are some hip-hop heads over at Marvel? Yeah, there are a few, but especially [Assistant Editor] Chris Robinson, who worked with me and [Talent Manager] Rickey Purdin on this campaign. Unlike me, most of my editors grew up in a world where Hip-Hop already existed. They can’t imagine a world where it doesn’t exist. It’s like my son, Tito, who’s 12 – he’s, like, “Papa, are you friends with any rappers that actually play on the radio?” He’s all about young guns like A$AP and Vince Staples and Earl Sweatshirt. What is the process that goes into recreating these covers? How do you choose which superheroes fit and which album covers to recreate? Where to start? Well, there were certain artists – certain covers – that we just had to do, know what I’m saying? Illmatic [Nas], The Chronic [Dr. Dre], Straight Outta Compton [N.W.A. ], 3 Feet High and Rising [De La Soul], The Miseducation of Lauryn Hill. And you can’t do something like this and not include artists like Wu-Tang Clan, or Meth, or Raekwon, or GZA, who drop references to comics all the time in their lyrics. This is your chance to holler back. So the process kind of started with those covers. There were a few [comic book] artists that I looped in right away because I knew they were Hip-Hop heads – Sanford Greene, Damion Scott, Juan Doe, Mike Del Mundo – and got them rolling on some of the most iconic covers right away, and we built from there. Like I said, some of the covers – the Sam Wilson: Captain America/Love.Live.A$AP homage or the Dr. Strange/The Chronic homage – were no-brainers. Others – the Karnak/Saturday Night: The Album cover, the Squirrel Girl/Wolf cover – took more thought. Hip Hop and comic books have always had this silent partnership behind the scenes, do you think these variant covers will bring these two world’s closer together in the public eye? That’s my hope. For decades, Hip-Hop artists have been shouting out to Marvel Comics; this is us shouting back. We’re two vital threads of pop culture that love to cross-pollinate with other art forms, so here you go. Fantastic. I knew this initiative would excite people, but I had no idea we’d get the crazy support from so many of the rappers themselves. Killer Mike was the first to give us a shout-out on Twitter. Questlove, Posdnuos, Pete Rock, DMC and Lil B all weighed in, too. The one that blew me away was Nas. When Mass Appeal showed him our Illmatic/Miles Morales homage, he said, “This is a dream in real life.” When the artists themselves embrace what you’re doing, that speaks volumes. There has been this stigma that there is a glass ceiling that doesn’t allow African Americans the opportunity to work as an illustrator at a major comic book company, but what is the reality of the situation? There is no glass ceiling. Marvel is always looking for talent, plain and simple. Race is not an issue. Our artists span the globe. Humberto Ramos is a Mexican, Leinil Francis Yu is Filipino, Sara Pichelli is Italian, Stacey Lee is Chinese-American, Frank Cho is Korean-American, Esad Ribic is Croatian, Mike Deodato is Brazilian, Mahmud Asrar is Turkish, Gurihuru is Japanese, Stephanie Hans is French, Gerardo Zaffino is Argentinian. And there is no absence of prominent Black or African-American artists. Olivier Coipel, Sanford Green, Damion Scott, Jason Pearson, Keron Grant, Brian Stelfreeze – all of them have worked – or are currently working – for Marvel, some factor into the near-future, and all are always welcome here. This variant cover program is already opening the doors for more Black artists. What’s your favorite cover thus far? Don’t even try, bro! That’s like picking a favorite child. As promised, here’s the latest installment of Marvel’s Hip-Hop variant project: Schoolly D’s Saturday Night! 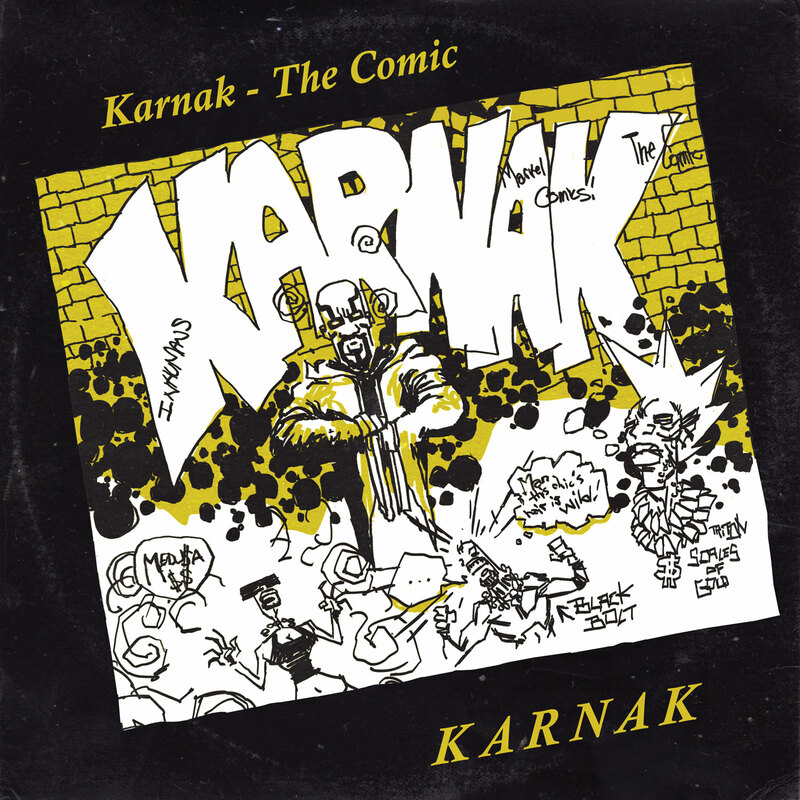 – The Album transformed into Karnak #1 – The Comic by Kaare Andrews.